Rugged, scenic Lolo Pass crosses visitors over Oregon’s Cascade Mountain Range near breathtaking Mt. Hood on a route once traversed by Oregon Trail pioneers. Located about 40 miles SW of Hood River and 6 miles NW of Mt. Hood. This gravel-road pass leads travelers down a former segment of the Oregon Trail for fantastic views of the Cascades. Mountain lakes, fishing, hiking trails, and scenic vistas highlight Lolo Pass Road. If your vehicle’s sturdy and your sense of adventure keen, a drive through Lolo Pass in the Mt. Hood National Forest has much to offer. A spectacular view of Mt. Hood’s western face, streams and lakes full of fish, and easy access to hiking trails through lovely old-growth rainforest are some of the features recommending this drive. Originally broken by Native Americans as a trading route, the trail now known as Lolo Pass once formed one of the final legs of the Oregon Trail. Some pioneers arriving from The Dalles would drive their livestock over Lolo Pass while remaining family members floated down the Columbia River to their settling destination. Today the 3,415-foot Lolo Pass is one of the milestones on the Pacific Crest Trail. The pass is located about 6 miles NW of Mt. Hood and 10 miles NE of the town of Zigzag. 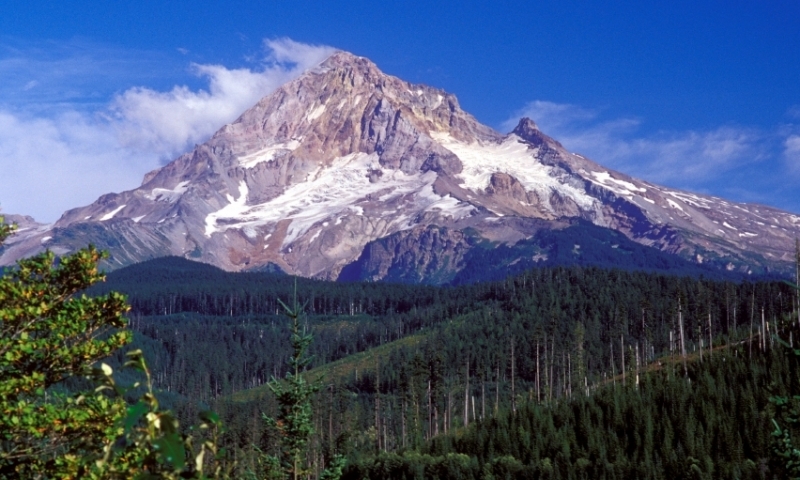 Visitors can reach Lolo Pass by taking the Mt. Hood Highway (Highway 35) south from Hood River to Oregon Route 18. Lolo Pass lies about 40 miles SW of Hood River. While the approach is paved, the road through the pass itself is gravel and is closed during the winter months. The way is not always easy to travel, and care is advised. Lost Lake, along Route 18, provides beautiful photo opportunities and great fishing (rainbow and brook trout, Kokanee salmon in season). Lakeshore Trail circles Lost Lake for an easy 3.2-mile hike. Magnificent view of Mt. Hood’s western side. Other nearby hiking trails, like the Huckleberry Mountain Trail, take hikers through old-growth hemlock stands and wild huckleberry patches. Lolo Pass Road ends at the Mt. Hood Villages and the Wildwood Recreation Site.